OMG! That is too funny! 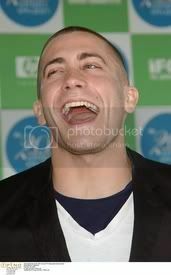 Of course if anyone wants to see a lot of Jake ... watch Jarhead. 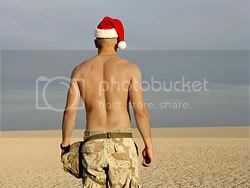 If only I'd be the Santa hat ... not the one on his cranium. (I was going to say … “not the one on his head ….” but I thought that could be interpreted two ways … if you know what I mean! Oh, I love him in both his Santa hats! And more short hair. Dang! This is one beauty of a man, inside and out. Hot damn, that man has a perfect back! Back's are my thing and that sure is a good one! I have to say my thing is asses. Jake's got one of the best. That's for sure! Oh yes! If only I could discover all of his features up close and personal. Sigh!